Lake Huron is one of the North American Great Lakes. This group included five lakes - lake Superior, lake Michigan, lake Huron, lake Erie and lake Ontario. Between Lakes Huron and Erie is located the smaller Lake St. Clair. All five lakes are located on the border between Canada and the USA. North American Great Lakes are all freshwater lakes, and are interconnected through rivers and inlets. All basins of North America are located on a total water area of 245 000 square kilometers. Lake valleys are located on the border between the Canadian province of Ontario (north) and the Misssippi plate. Lake Huron is almost as large as Michigan. Huron is located north of Lake Michigan and the relationship between the two is via the Straits of Mackinac. In terms of hydrography, Michigan and Huron are combined into a single system, but geographically speaking, practice has been adopted to treat them as 2 separate Lakes. Lake Huron extends a total area of 59600 square kilometers, which automatically makes it the second largest of the North American Great Lakes. Huron was formed at an altitude of 176 meters, average depth of water is about 60 meters and the estimated maximum depth is 229 meters. The name of the lake is given by French explorers who encountered Huron first, and only thereafter all other large water bodies of the group. It is named after the name of the local Indian tribe Huron. This huge body of water acts as the main connection between all the lakes because it receives inflows from Michigan and Lake Superior, as well as many others. Between Lake Superior and Lake Huron a lush river flows with many rapids and waterfalls, which has been replaced by a wide waterway with a lock, convenient for shipping. Lake Huron connects through a navigable river with Lake St. Clair, and it drains to Lake Erie. The area of Huron gives it place as the third-largest freshwater lake on the planet, but if conting and the Caspian Huron it stands in fourth position. The total length of the shores of this basin is 6157 km, quite large towns are located along it. Among them are Goderich, Sarnia, Bay City, Alpena, Rogers City, Cheboygan, St. Ignace and Port Huron. In Huron the largest island in the world, located in freshwater, was formed as well. The island is named Manitoulin, and it separates the North Channel from Georgia Bay (Georgian Bay). In Lake Huron there are about 30 000 small islands. The bottom of the Huron is covered with the remains of sunken ships. One unfortunate date - November 9, 1913, is associated with a huge violent storm which is the reason here sank 10 ships and dozens more tipped off the coast of Huron. But the debris of hundreds of shipwrecks have been recorded, the oldest being more than 17 centuries old. 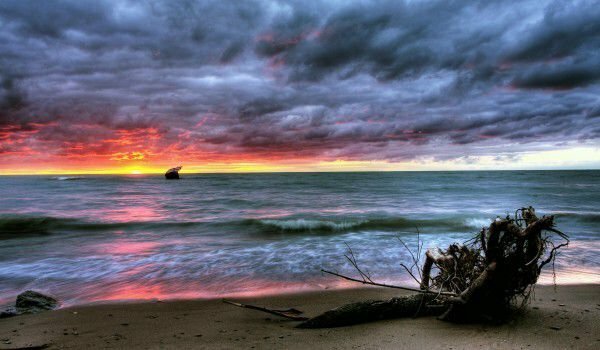 Georgia Bay is the largest bay on the Huron, and here are found the most remains of sunken vessels - 212 whole ships lying at the bottom of the bay.